Full-Size Meals: Each full-size meal provides at least 4-6 generous servings. For smaller families, most meals can be split in half while you are assembling them (see below). Meals for smaller families: A great option is to divide your meals in half. By adding the one-time split fee, you will split each full-size dinner in half creating two meals that serve 2-3 each. 8 full-size meals that serve 4 to 6 can be divided into 16 half-size meals that serve 2 to 3. The fee is $8 for the 8 meal package (which makes 16 half-size meals), and $12 for the 12 meal package (which makes 24 half-size meals). Please note that not all meals can be split as noted in the entree description. Half-Size Meals: The Dinner Club also offers a service that is wonderful for small families. As part of our "Pickup Orders", we offer 8 or 12 half-size meals that serve 2-3 people each. We will deliver your meals to you or another family. This is a great way to help someone out in a tough time. There is an additional fee of $25 (up to 10 miles) for this service. $5 for every 5 additional miles*. Please select this service when ordering on our website or call our facility for more information and delivery options. Please call the store for quotes on areas outside the 10 mile radius. *Delivery option is not guaranteed until approved by The Dinner Club. 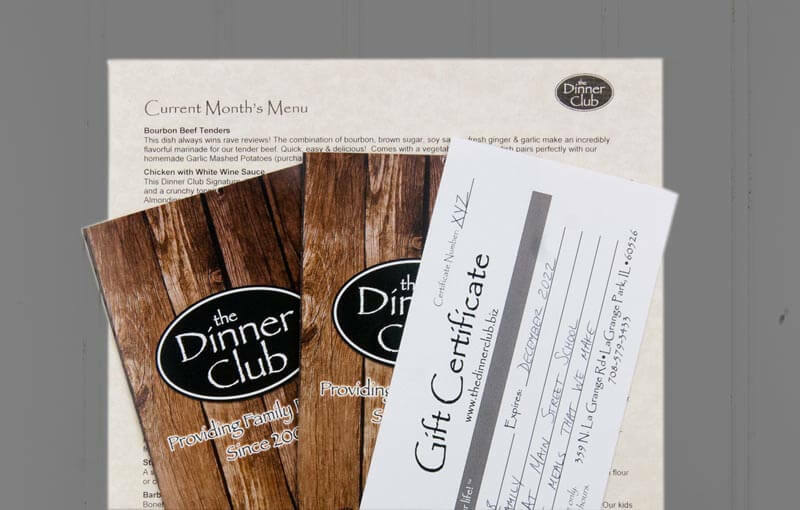 The Dinner Club gift certificates make great gifts! Birthdays, showers, weddings, new baby, Christmas, Mother's or Father's Day or any special occasion. Any denomination is available. To purchase a gift certificate, click below.